Before they could cross the Bitterroot Mountains, the exhausted Corps needed horses and a native guide. Lewis spent sleepless nights "dwelling on the state of the expedition...the fait of which appeared at this moment to depend in a great measure upon the caprice of [the Shoshone]." As he feared, Chief Cameahwait was wary and suspicious. But when, in a moment straight out of a movie of the week, the Chief recognized Sacagawea as his long lost sister, he and the tribe were eager to help in any way they could. Lewis and Clark's four month stay at Fort Clatsop was characterized by rain, cold, and hunger. When they were met with yet another dreary day, Clark bitterly expressed his thoughts of the Pacific. "I have not Seen one pacific day Since my arrival in its vicinity, and its waters are...tempestous and horiable." 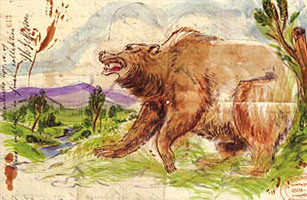 While out exploring the Missouri, Lewis was attacked first by a bear, then by a "tyger cat" (possibly a wolverine), and finally by three buffalo. Understandably miffed, Lewis thought to himself, "It now seemed to me that all the beasts of the neighborhood had made a league to distroy me..." And as if that weren't enough encounters with the great outdoors to last a lifetime, he awoke the next morning to a rattlesnake coiled beside him. When Indians at Fort Clatsop refuse to lower the price of their canoe, the expedition steals it while Chief Coboway is visiting their fort. Lewis rationalized their actions  "we will take one from them in lue of the six Elk which they stole from us..."
When out hunting one day, one of the expeditions interpreters, a near-sighted Pierre Cruzatte, accidentally shot Lewis in his buttock. "Damn you, you have shot me," Lewis cried in anguish. When Cruzatte didn't respond to his angry calls, Lewis fled to get help, suspecting an Indian attack. But a search turned up no Indians, only an abashed Cruzatte. Toussaint Charbonneau may not have been hired if not for his wife, Sacagawea, who was needed as a translator. He held up the expedition with his ailments, he hit his wife, and worst of all, he came dangerously close to capsizing the main supply boat, nearly losing "almost every article indispensibly necessary to...insure the success of the [expedition]." A crew member had to threaten to shoot the wailing Charbonneau to get him to help right the boat. Lewis called him disdainfully "the most timid waterman in the world..."
One of the items the expedition carried in its supplies was the frame of an iron boat Lewis had designed. They hauled the iron skeleton halfway across a continent intending to use it to carry baggage and supplies. The men spent three weeks preparing the boat  hunting elk, carefully shaving hair off the tanned hides and sewing skins to the frame. Lacking pine trees to make a proper tar to seal the elk skin seams of the boat, Lewis improved with a mix of ash, buffalo tallow and beeswax. When the time finally came to launch her, Lewis was initially delighted, "she lay like a perfect cork on the water." But pride soon turned to anguish as the substitute tar failed to hold and the boat quickly began sinking. Lewis wrote "this circumstance mortifyed me not a little." After sadly bidding "a dieu to [his] boat, and her expected services," Lewis and his men left it behind, not bothering to retrieve it on the return journey. While near the Great Falls of the Missouri, Lewis and Clark repeatedly heard an inexplicable rumbling noise, much like thunder, which Lewis referred to as the "unaccounable artillery of the Rocky Mountains." Unable to pinpoint its exact source, Clark wrote "I am at a great loss to account for this Phenomenon." Though there have been several speculations concerning their origin, these cannon-like booms still have yet to be identified. Displaying the will of a modern-day feminist, Sacagawea stubbornly insisted that she should be allowed to see the Pacific Ocean and the greatly anticipated beached whale. "She observed that She had traveled a long way with us to See the great waters, and that now that monstrous fish was also to be Seen, She thought it verry hard that She Could not be permitted to See either..." The men gave in to her demands and Sacagawea triumphantly accompanied them to the coast. Perhaps it was out of fear of being the next meal that Lewis' dog Seaman was such an extraordinary member of the expedition. And with dog being such a popular trail dish...who could really blame him? In addition to hunting animals like squirrels and antelopes, Seaman saved the sleeping camp from being crushed by a buffalo one night by bravely running towards him, "causing him to change his course."